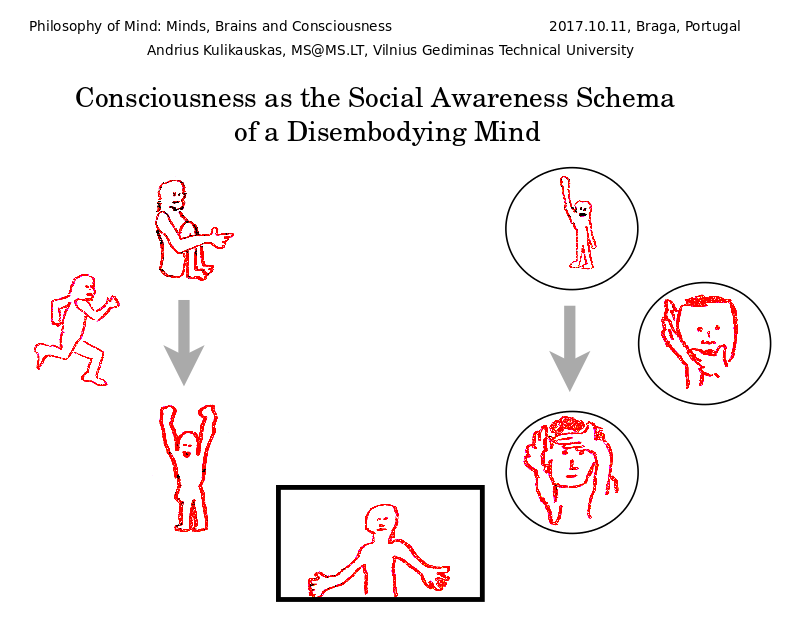 Presented at the III International Conference on Philosophy of Mind: Minds, Brains and Consciousness on October 11-12 in Braga, Portugal. I will describe our experience of life as governed by only eight cognitive frameworks. I arrived at these frameworks by exploring my own imagination, namely, the ways that I am able to divide everything into two, three or more perspectives. But I will show that these frameworks can be thought of as the way that joint intentionality, as studied by Tomasello, is broken down into roles that one can recognize, inhabit and perform. Here I show the most complicated of these frameworks, which establishes seven perspectives or roles. 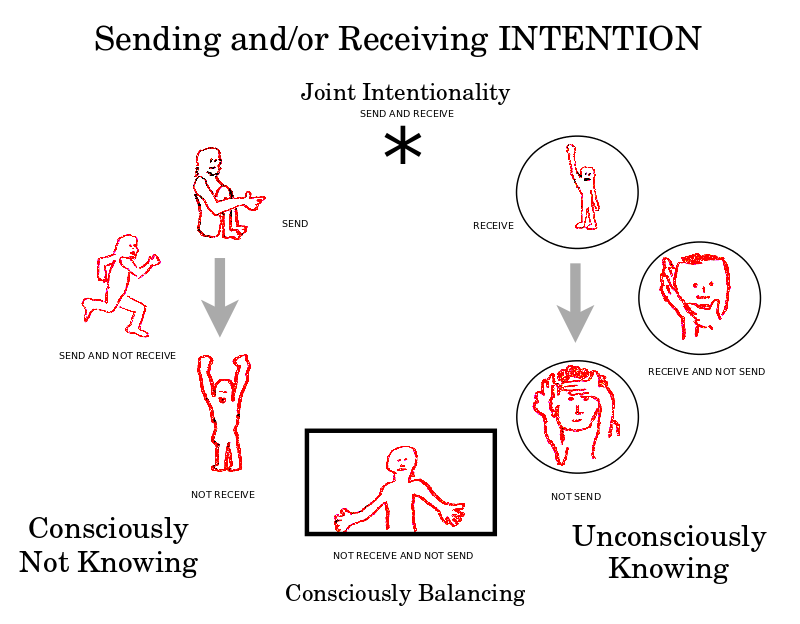 I will show why these frameworks do not grow more complicated but rather we experience shifts from one framework to another, as three degrees of awareness. We thus do not experience reality directly through our body, but rather we live in a tiny, abstract structure, like the eight corners of a cube, from which we set the parameters by which we interpret and create our lives. A crucial theme in my talk is that we are, on the one hand, creatures of knowing, but on the other hand, our environment challenges us to focus on what we don't know. Indeed it is what we don't know which has us grow in what we know. We don't know what we are supposed to do in life, but we integrate our accumulated knowledge to approximate our best knowledge. 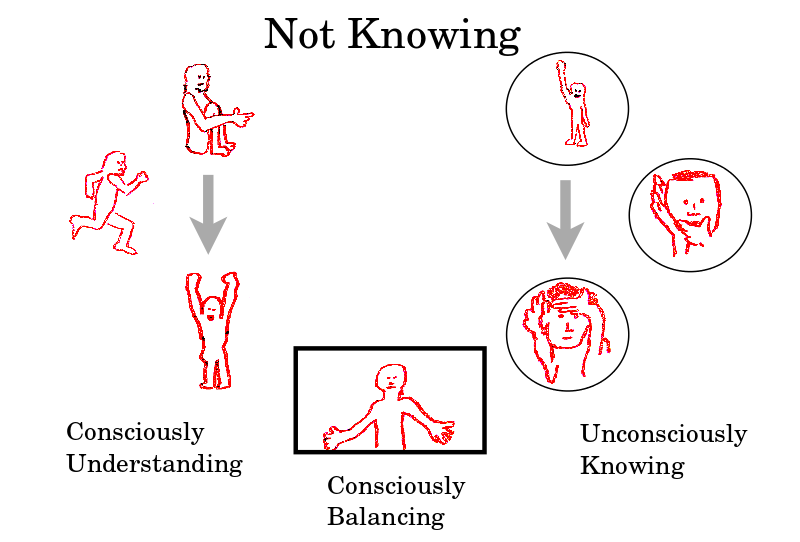 Thus we find ourselves with two ways of thinking, an unconscious mind that draws on all of our life experience to tell us one best answer as to what we know, but also a conscious mind that is able to frame questions in a way that impels the unconscious to give several answers from different perspectives. In Kahneman's terms, these are fast thinking System 1 and slow thinking System 2. The cognitive frameworks that I introduce will ultimately balance these two very different ways of thinking so that we are truly free. My observations stand in contrast to an impressive accumulation of evidence regarding the embodied mind, which is to say, that a mind requires a body. For example, Lakoff has noted that in cognitive metaphors such as "caring is warmth", the target domain ("warmth") is always more directly relevant to the body (the body is always measuring warmth). But this same evidence can be used to speak of a disembodying mind. Indeed, we face evolutionary pressures to marshal our resources and to think strategically, to focus on what we don't know and how to further define ourselves with one-time and first-time activities, whereas our bodies define who we have been, what we have known, based on our recurring activities. Thus we have these two perspectives. 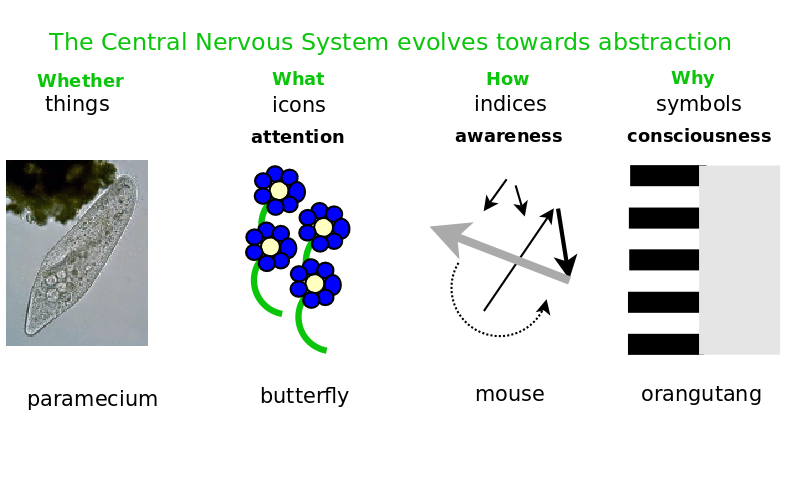 I will make my approach more plausible for materialists by noting how the central nervous system evolves towards abstraction. A single-celled paramecium engages the world directly by way of its receptors for light and chemicals. But a butterfly lives in a world of flowers, that is, a neural representation of the world in terms of sensorial images which it pays attention to. As neuroscientist Michael Graziano has noted, a mouse furthermore has awareness, in that it utilizes a model of attention which it can identify not only with its own attention, and thus be itself aware, but likewise model a cat's attention, and thus be aware of whether or not the cat is attending to the mouse. Thus the mouse lives an abstract world of indexical and causal relationships. But humans and perhaps the great apes can moreover be conscious, that is, we can choose what we wish to be aware of. Birute Galdikas has noted how orangutang males go off to live alone, as if they were Zen Buddhists, and how they can choose to ignore people or not. We humans can choose to "step in" and immerse ourselves in a subjective experience, or to "step out" and consider objectively what is going on, what others are experiencing. I will describe us as experiencing cognitive frameworks by which we divide up what neuroscientists call our global workspace into various perspectives they may take up for a particular issue, for example, contemplating "free will" and "fate". Indeed, I will describe our conscious life as shifting amongst eight such cognitive frameworks. They substitute our world with a highly constrained abstract model of options within which we adjust parameters that subsequently trigger the workings of our involuntary, unconscious mind. Everything has no external context. If you put it in a box, then it includes the box. If you think it, it includes you. Everything has no internal structure. It can be chaotic or orderly. Thus, all statements are true about everything, for there is no structure to hold onto: Everything is hot, everything is cold, everything is good, everything is bad. 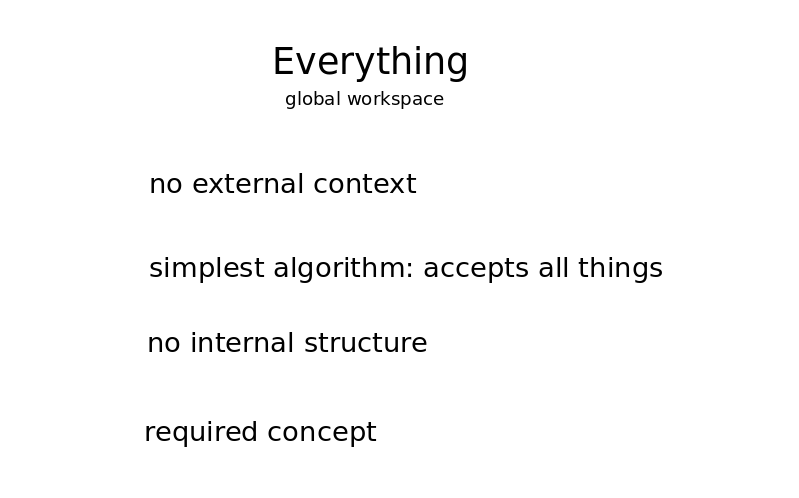 Everything is the simplest possible algorithm, the one which has no filter but accepts all things, whatever we think of. This means that we all have the same Everything, although we may call it by different names, such as Being, Love, Meaning and so on. Everything is a required concept. We all have it, and appeal to it, for example, when we take a stand, which we do with regard to everything. We could not have learned of Everything, because all that we know is bounded, but Everything is unbounded. We cannot rid ourselves of it as a concept. It must have always been with us. In considering a particular issue, we divide everything into perspectives. For example, matters of existence require two points of view: We need to be able to raise a question, does a chair exist or not? but also suppose an answer: If it exists, then it exists; if not, then not. 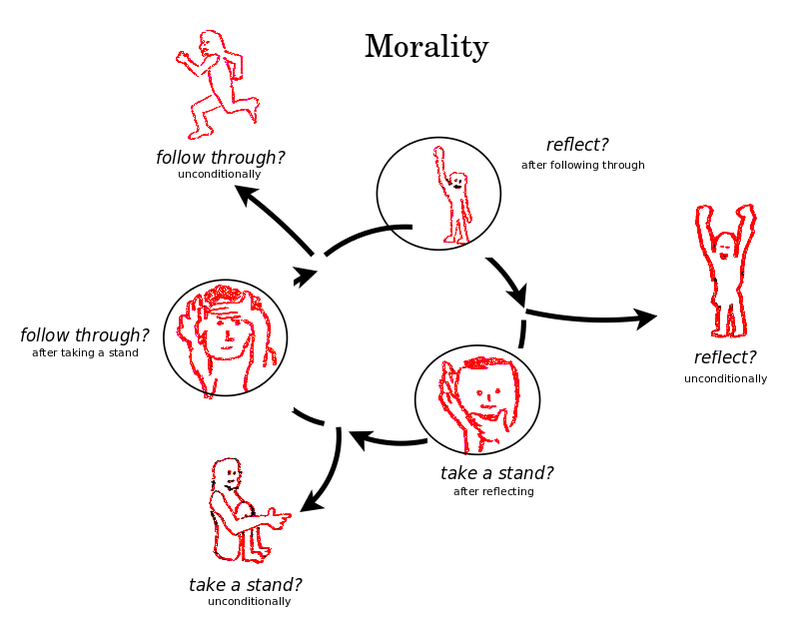 Similarly, questions of participation require three points of view: a cycle of taking a stand, following through, and reflecting. Such a cycle is the basis for the scientific method: having a hypothesis, conducting an experiment, and intepreting the results. Issues of knowledge require four points of view: whether, what, how and why. We experience a cup as a sensory image, What, but also as a mental blueprint, How. We may furthermore imagine Whether the cup is in a cupboard even when nobody sees it. And when we imagine Why there is a cup, then we suppose that we must know its relationships with absolutely everything. In documenting such frameworks, I introspect my own imagination's options. I also note how I conceive the same cognitive frameworks by different representations, which are manifestly limited in their variety. Indeed, our minds do not conceive the division directly but must employ one or another representation. For example, I can imagine the perspective of opposites coexisting as "free will" and the perspective of all being the same as "fate". Indeed, classic, intractable debates such as "free will vs. fate" are important evidence for these frameworks. Throughout history, different philosophers describe similar frameworks in their own terms. Another representation is in terms of outside and inside. If there is an an outside of a cup, then there is also an inside. But if I fall inside the cup - if it becomes my universe - then there is only an inside. Note also that our mind slides easily from outside to inside, or from free will to fate, but not the other way around. A third representation is in terms of theory and practice. In theory, I am detached from what I am studying, as if it were a machine that is turned off. But in practice, the machine is turned on, I am one with my experience, like a carrot going through a mill. We complement each other and are one. Same and different are a fourth and final representation. If two cups are the same, then they must also be different. But if they are different, then they are just different. Here it is remarkable that the concept of sameness actually involves opposites coexisting, whereas the concept of difference means that all is the same. This illustrates the pitfalls of introspection because adding a layer of reflection typically reverses the direction in which our minds move. As you will see, additional evidence for these divisions and their representations is that they serve as building blocks for more elaborate frameworks, and also ever reappear in classifying the basic frameworks. 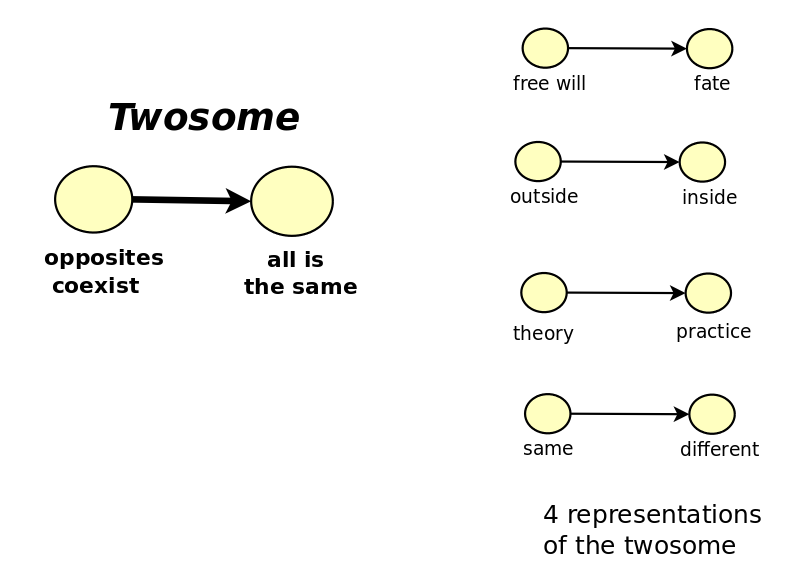 The Foursome, the framework for knowledge, has two representations. Idealists consider the observer's perspective, their questions, and consider Why most important and dismiss Whether as irrelevant. Materialists think in terms of answers, the observed's point of view, and so for them Whether is most real and they would eliminate Why. Kant understandably tried to straddle both points of view. The semiotician Peirce distinguished three kinds of signs. Icons leverage Whatness, indices leverage Howness and symbols leverage Whyness, but we should additionally consider the Whetherness of the signified thing itself. In preparing for this talk, I was inspired by Tomasello who I learned more about. He emphasizes joint intentionality. 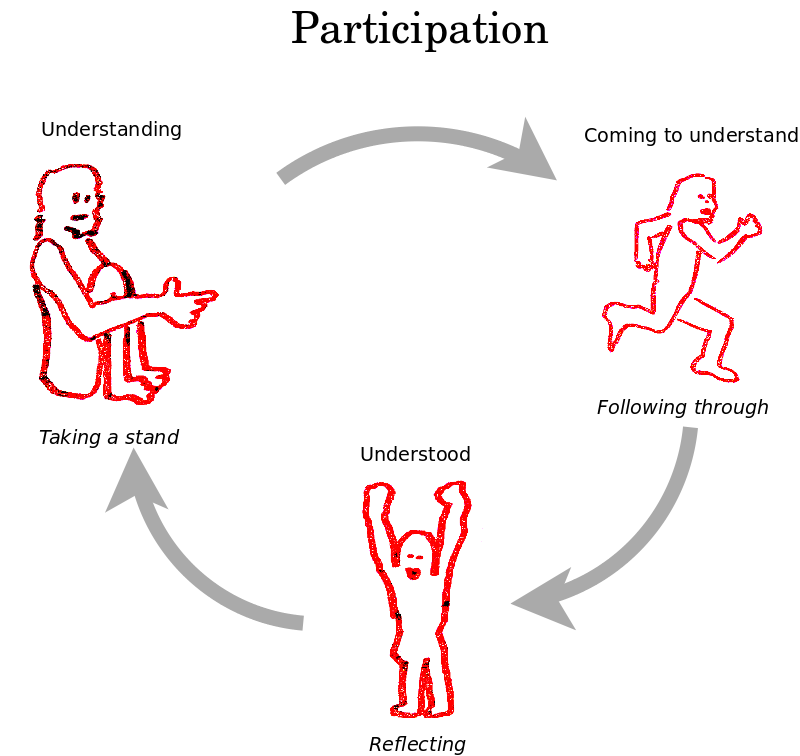 What makes humans different from other primates is that temporarily we are able to suspend our own interests and construct a "we", like a blank space by which we come together to do a joint action such as hunting an animal, and then we want to share the results of this just activity. In pursuing this kind of joint activity, we establish roles. Just imagining, based on what I've done, I can imagine what those roles might be. I've looked at understanding as a fundamental activity. For example, in understanding, or in gesturing with a finger, the person with the finger understands. But the other point of view is that you come to understand, which involves that opposites coexist in that I didn't understand but now I understand. But what do they have in common, the one who understands and the one who came to understand? What they have in common, what is joint among them, is what's understood - maybe someone needs help. That becomes their joint intentionality expressed in three roles now. This new role is basically introduced by reflection. So you reflect on joint intentionality and that creates a new role. We can reflect on that join intentionality again. For issues of knowledge you'd like feedback. You'd like to know whether that helps or is unsatisfactory. 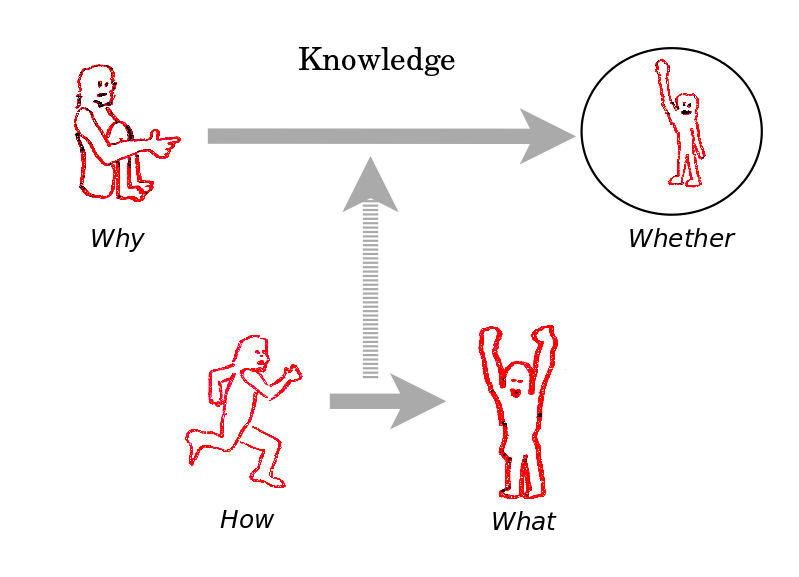 You get the structure for knowledge, in a practical sense - how and what, and in a theoretical sense - why and whether. These are three examples. This attempt to document our imagination's options simply and absolutely and thereby model everything forces an economy, much like evolution forces an economy, which encourages us to consider whether time and space are simply two representations of a shared cognitive framework, namely, for decision making. We experience time in two very different modes. We can be focused on the near past and the near future, looking slightly ahead and slightly behind, immersed in life's obligations. But in order to live the present, we need to make room for it by pushing our past back, to our values, which we may imagine as existing prior to us, and pushing our future forward, to our dreams, which may perhaps be fulfilled after we are gone. And so we create a gap that severs any practical link between long ago causes and far off effects. Such a model distinguishes two directions in time with which we are familiar. "Every effect has had its cause" and so, practically and personally, our mind readily jumps backwards to identify causal chains. But "Not every cause has had its effects" and so, theoretically and impersonally, we imagine time marching forwards through a sequence of discrete events. Those events are defined by imagining them in the present, where both directions are available to us. We can argue a similar model for space if we note that statically causes are ultimately external to a system whereas effects are internal to it. However, we will suggest later that in space, the boundary disambiguates the outer system and the inner subsystem, whereas in time, the present overlaps our experience of causality in the forwards and backwards directions. Any attempts to cognitively model time and space in terms of discrete perspectives will thus have to explain how we construct what we experience as a continuum even if we might suppose that such a continuum exists. And we construct that experience by jumping around between different perspectives, both forward looking and backwards looking, rather than experience them as a continuous flow, as we have been taught to imagine. 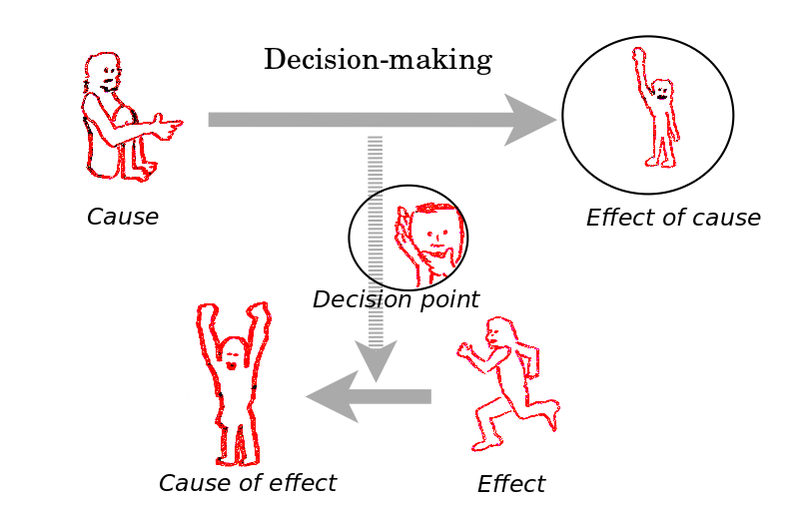 Decision-making is the cognitive activity which thereby has us circumscribe our decision point, either the present in time or the boundary in space, by which what is unknown, impersonal and theoretical becomes known, personal and practical. 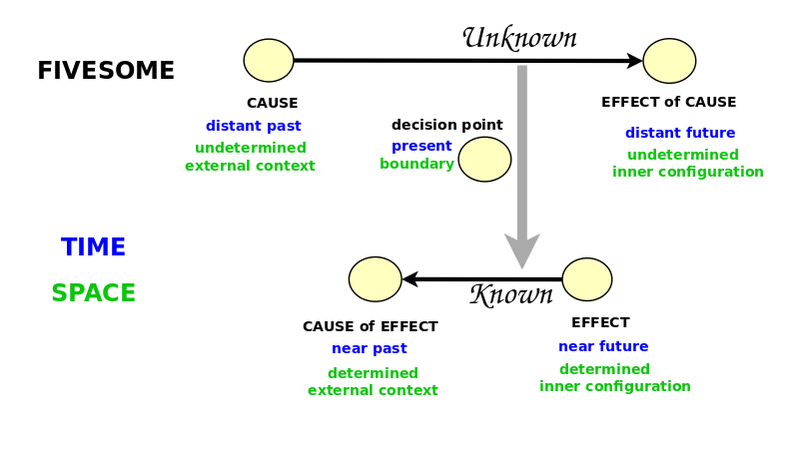 Decision-making models causality by approximating the unknown with the known. It thereby fosters the ambiguity, which we experience in the present, and which arises in the study of entropy, as to whether we live in an open system or a closed system. It also relates our practical, singleminded, unconscious mind, full of knowledge, with our theoretical, multitrack, conscious mind which is able to contemplate not knowing but rather framing questions into perspectives which the unconscious mind takes up. I started drawing these bubbles. These bubbles mean that we have started to have knowledge. In constructing and refining this joint intentionality, we are able to imagine whether that is, it could be or it could not be. We start to get oppositions, these logical choices, and so this internal structure gives this sense of knowledge that there may be internal tension or internal options that we don't directly know of but may be beyond us. And this allows us to hook into all that the unconscious might build in terms of external memory, masses and masses of external memory. And so this decision point involves a role that somebody is deciding what to do. They are trying to figure out. A primate and certainly a human can look at another person and decide that that person is kind of on the fence, they are wondering or they are formulating a thought. We experience the present as theory becoming practice one thought at a time. If you want to know how big the present is, it is one thought big. That is the atom. In the present, there is an overlap, but in space there is a disambiguation also which creates the negative of it. To be more concrete, the world and the self are separated by a boundary and they are distinct. We'll see that when we look at emotion. 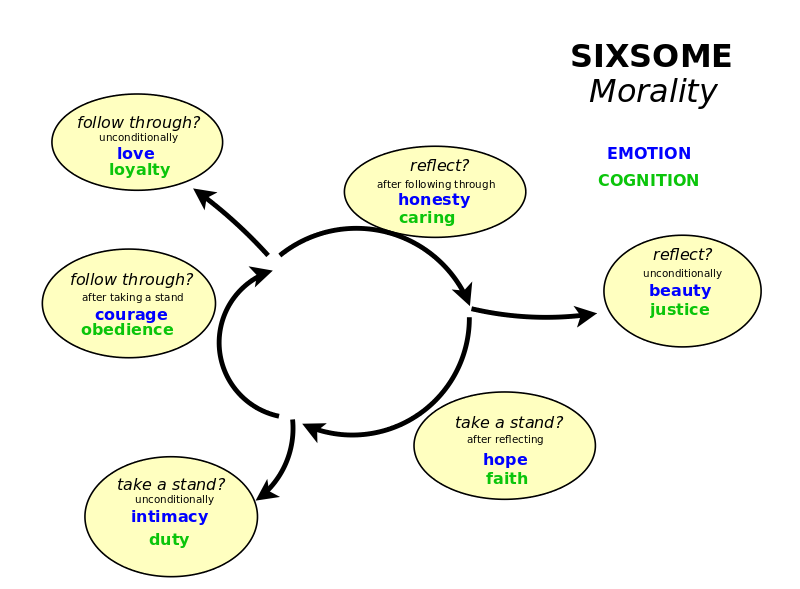 In surveying these frameworks, I note that there is a sixsome for issues of morality. One representation, in terms of cognition, is spatial in that it has us internalize outer perspectives, such as loyalty, into inner perspectives, such as faith. Another representation, in terms of emotion, is temporal in that it has us immortalize our positive but fleeting emotions, such as beauty, as virtues of our character, such as courage. These are the kinds of things that Plato talked about. From a primate point of view, there is this kind of absolute knowledge, and there is a personal relative knowledge. In the case of absolute knowledge, if you really know who knows, then you should obey the one who understands. They know what they are doing. So you have to have a mode where you are obedient, you are acknowledging them. But when you're not connected, you're on your own, you have to do what scientists do: I take a stand, but then I ask myself, do I go do it? In other words, do I put my money where my mouth is? And when I do it, then I ask, Do I look at what I'm doing? Finally, I think a lot. Do I take a stand? There is this three-cycle that we have to live. 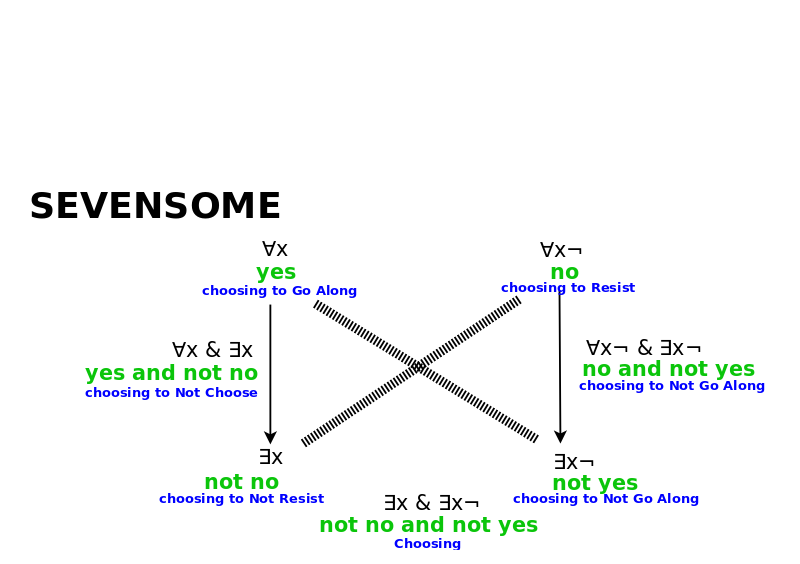 Finally, the sevensome establishes the logical square which we need for a self-standing system, including the ability to divide and thus define opposites such as true and false or good and bad. The slack in this system is represented as either increasing, as with the present in time, or decreasing, as with the boundary in space. An eighth perspective would include the possibility "all are true and all are false", in which case the system is empty, it collapses and we have the Nullsome, the division of everything into no perspectives, like a blank page, by which we contemplate issues of God. These issues of God are basically what joint intentionality is all about. It's this mystical blank page that we can start from in constructing things in our imagination. I imagine it's about sending and receiving. You can send information and you can receive it; you can not receive it; you can not send it; you can send it and not receive it; you can receive it and not send it. This is Greimas's semiotics square. You get the logical possibilities for a system. 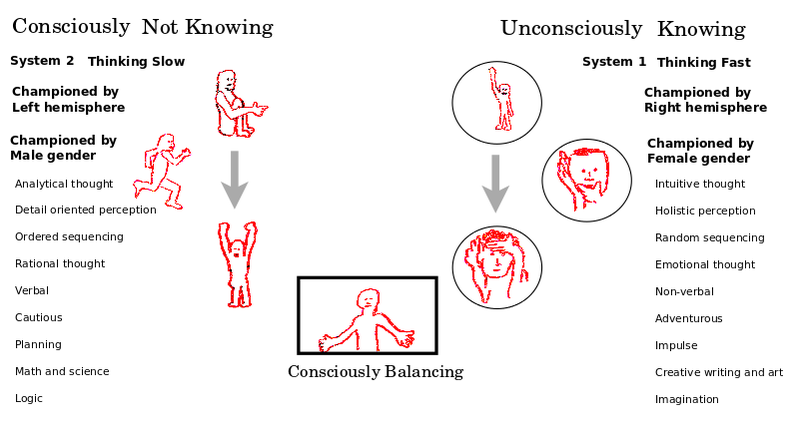 On the left hand side is the unconscious knowing that is growing. On the right hand side is what we don't know. We don't know, we're just doing what we're told to do. We are believing somebody who knows better. But that's not knowing actively. Whereas on the left hand side are we trying to know. We are drawing on our super massive unconscious knowledge. What this does logically is to show that we need a balance to not receive and not send and have this gap between them. But the whole system would collapse if sending and receiving happened together. I think it collapses into memory. When the system is complete the whole thing vanishes because it can be stored somewhere in memory. 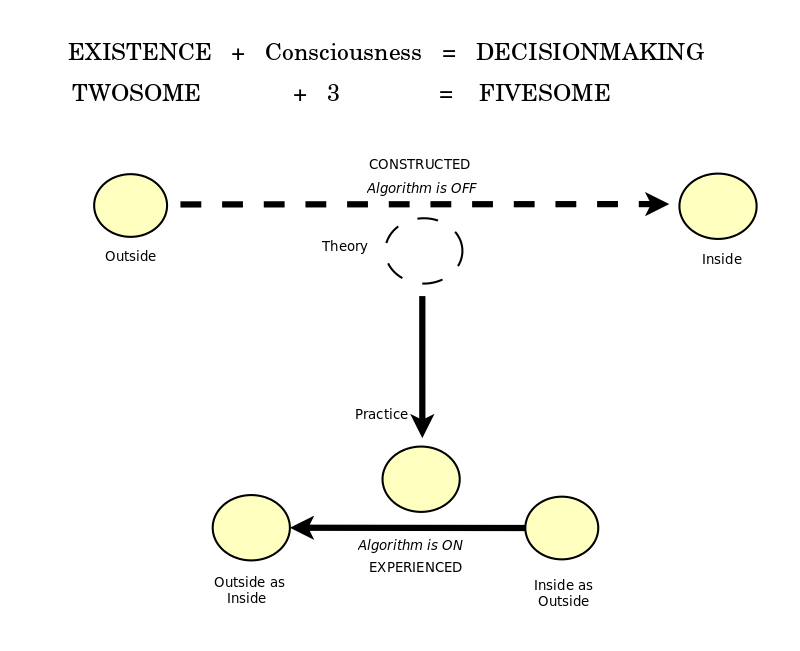 I have thus surveyed eight cognitive frameworks, divisions of everything, which I believe fully describe our conscious experience as a series of philosophical issues that we grapple with. I imagine that we contemplate them even in the womb, and perhaps orangutangs may likewise, and truly any system such as a cloud or galaxy tends toward the same set of options by which its conscious side may govern its unconscious side. We can then model human reflection, awareness and consciousness, shifting our minds from issue to issue, adding one, two or three perspectives to each frameworks. I will interpret two equations, examples of consciousness, that bear on our experience of time and space. Suppose that we are engaged with issues of existence and then we become conscious of that. I will describe how our consciousness adds three perspectives so that we are now engaged with issues of decision-making. Here I will model consciousness as the ability to turn our awareness on or off. So let us conceive of the issue of existence as an algorithm, procedure or machine. Such is the representation which takes us from outside to inside. In theory, the machine is off, and then in practice, the machine is on. Thus we can combine two versions of this machine, where our mind slides from theory to practice. Note, however, that we don't ourselves experience the theoretical perspective but rather it simply keeps our outside view from becoming an inside view. Whereas we do experience the practical perspective because it has our outside view be one and the same. Thus we see that decision-making has a causal flow from outside to inside, in the sense of How, functionality, but also a flow from theory to practice, in the sense of What seems. 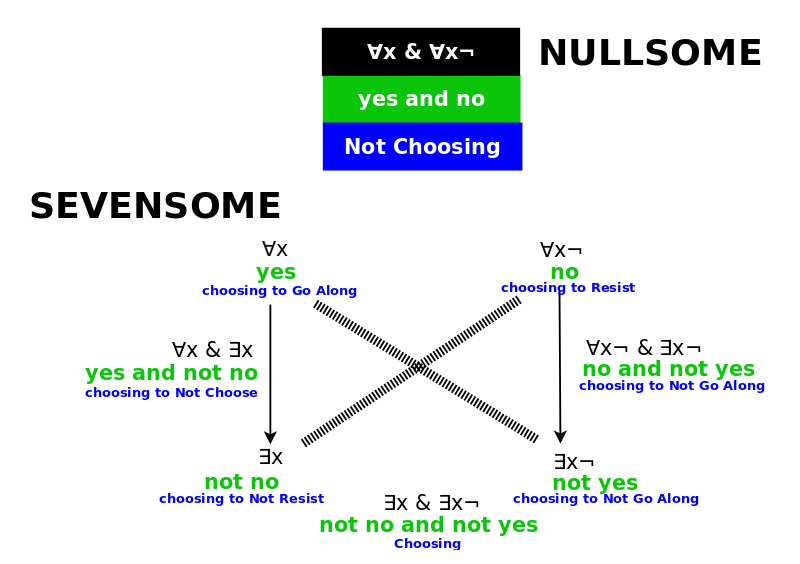 Here the decision point finds itself very much in the realm of practical experience. We experience the present as our ability to turn existence on, that is, to engage theory as practice. Note also that, in that realm of practical experience, our mental direction reverses direction for we have inverted our situation, and have started from the inside of the machine as our outside, and we experience the outside as our inside. Finally, we see that beyond our five perspectives there has opened up, in theory, a sixth slot in which we can hold, entertain and suppose a concept which we yet do not ourselves conceive. 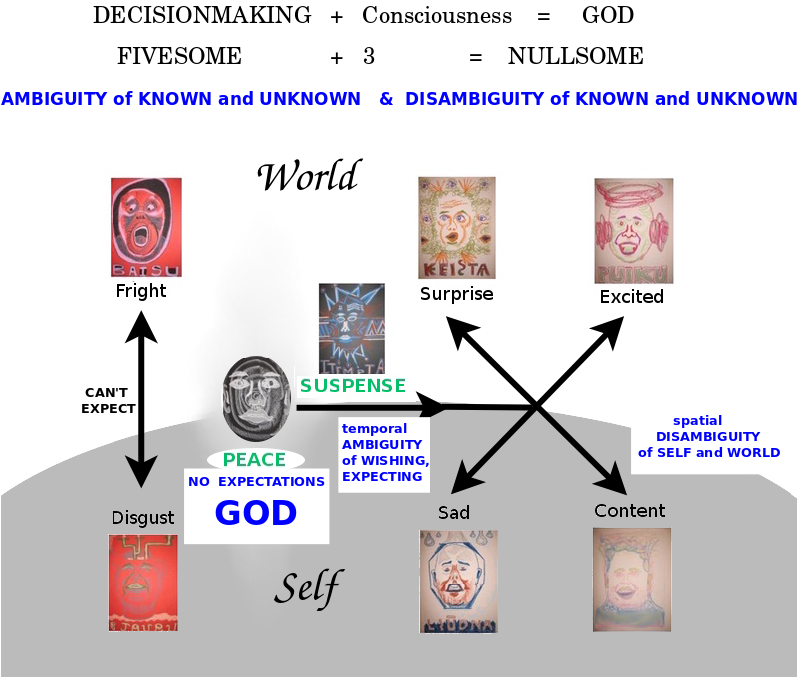 Finally, I will describe how consciousness of decision-making bring us to experience issues of God. Namely, I will show how time and space taken together make the known and the unknown both ambiguous and unambiguous so that all distinctions disappear and we are left with no perspectives, and no expectations, but simply peace, wishing for anything. We can model our emotional life as based on expectations and our resulting knowledge. If I expect something and I am wrong, then I am surprised, whereas if I am right, then I feel excited. But if it was profoundly important to me, and I am wrong, then I am distraught, but if I am right, then I feel content. And if it is too sudden for me to make an expectation, and it comes from beyond me, then I feel frightened, but if it is too strange to make an expectation, and it comes from within me, then I feel disgusted. Thus our emotional life marks a boundary disambiguating our self, what we should know, and our world, what we don't know, our feeling of sadness, contentment, and disgust on the one side, and surprise, excitement and fright, on the other side. But before we know the consequences of our expectation we feel suspense, or we simply don't have expectations and feel peace. Temporally, we live as creatures of not knowing who experience the ambiguity between expecting (and ultimately knowing) and simply wishing and waiting and perhaps never knowing. Spatially, we live as creatures of knowing, who disambiguate the self we know and the world we don't. Taken together, we have both the ambiguity of the known and the unknown but also the disambiguity of the known and the unknown. This makes for a collapse of all distinctions and we are left with no perspectives but simply peace. This model suggests that time and space must be kept apart so that they play their distinct roles, with time fostering ambiguity before we have knowledge, and space fostering unambiguity after we have knowledge. We also see why time, being ambiguous, might define one free dimension, whereas space, establishing disambiguity, might define three free dimensions, distinguishing the inner self, the outer world and the disambiguating boundary. I have presented findings from my quest to know everything, to discover absolute truth and to apply that usefully. I have proposed that the same divisions of the global workspace that define roles which primates imagine they can take are the same divisions at the heart of philosophical debates. Of course, these frameworks leverage massive amounts of unconscious knowledge in the form of external memory. I myself am thinking that this same system is latent in every subsystem, in every self, which would mean that we can lovingly support each other so that our always fragmentary consciousness is accentuated. And so small children, the mentally challenged and even pets or computers may experience consciousness in a loving environment. I also propose that we can revisit the significance of brain lateralization which has been relegated to pop psychology. I hope to have shown the relevance of balancing the conscious and unconscious ways of thinking. These are the familiar, old distinctions between intuitive, holistic, emotional thinking, analytic, detailed, rational thinking and so on. They are not born out when you look at the brain neurologically. You'll find all kinds of cross connections and it can be implemented in all kinds of ways. But I think I have shown that it would be natural to suppose that in the mind there are champions for one type of thinking and champions for the other. Those two champions need to be found in the brain. When you see these two hemispheres, you wonder what are they doing? It's not the exact implementation that's important, it's the principle. The way that the mind works doesn't have that much to do with the implementation. That's why psychologists can't find that model I gave of our emotional lives. It's because they don't believe in an emotional manifold. They believe that crying is an emotion or that your heart rate is an emotion. Yet as human beings we know that there must be a neural or any kind of manifold where you can compare disgust and happiness and so on. It's not difficult to implement neurologically just as you implement a body map. But psychologists don't think that way, so they don't find it. It would be like linguists who said that shouting and whispering are two different things and they could never mean the same thing. But we know that you can shout a name and whisper a name and think a name. It's referring to some kind of manifold in the brain where all this is comparable. That would be the conclusion. If we are looking for a model of the mind, then the mind is not the brain. Given a good model of the mind, I think we could understand the brain. We see mathematics being implemented on many computers, with many kinds of hardware and software, but that doesn't explain what math is. In the same way, the brain can't explain what the mind is. The mind can explain what the brain is. 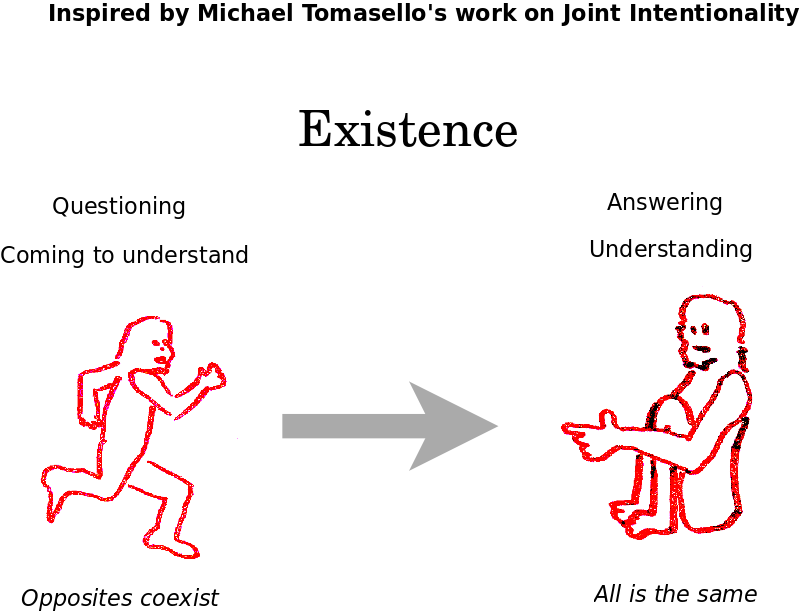 Thank you to Valentina Trombetta for introducing me to Michael Tomasello's work.